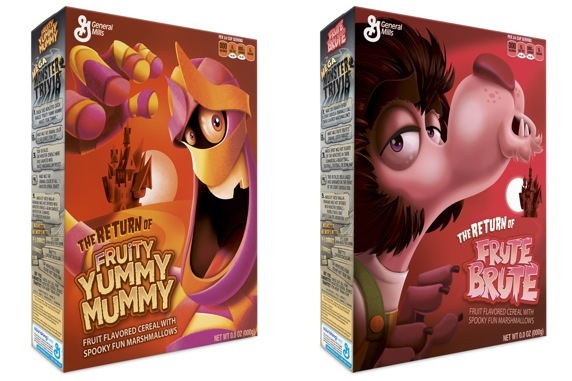 In 2013 Count Chocula, Frankenberry, and Booberry had two old friends re-join them on store shelves. I’m delighted to say I got be a part of it. Frute Brute and Yummy Mummy had each made brief appearances in the past but this was the first time all five flavors were on store shelves at the same time. Ultra Creative in Minneapolis was tasked with helping give the two characters a modern refresh, and they selected me to do the final packaging illustrations. This was a huge honor! It was also a bit of a challenge because we had to try to match the style of the existing monsters which were created a few years ago by another illustrator. Art director Todd Demulling worked up some rough character designs and then gave me the ball to run with. He was very helpful as we worked back-and-forth. I created the detailed artwork and then Ultra Creative made some final tweaks in-house. This is a very high-profile project and I’m deeply grateful that the very talented team at Ultra Creative felt they could trust me with it.